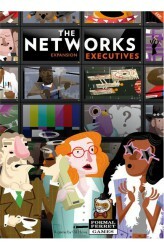 The Networks: Executives, a full expansion for The Networks, changes the gameplay in a few ways. First, the players all choose a Network Executive at the start of the game. Each Network Executive has their own advantages and drawbacks. Second, there is a new deck of Show Cards with a different mix of Genres. Each Genre now has an equal chance of appearing, unlike in the base game where Reality and Sports shows were less common. However, Sports Shows now have a higher upkeep, and Reality Shows don't get you as many Viewers on average as another Show with a bunch of Stars. Third, players no longer automatically get starting Public Access Shows, Stars, or Ads. Instead there is a starting "Pilot Season" draft in which players pick their starting TV shows. These starting Sho.. 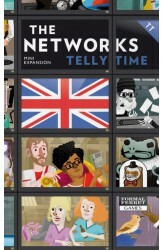 The Networks: Telly Time, an expansion for The Networks, features nine genres and a new "noughts-and-crosses" way to get a genre bonus, with the shows in this item likely to be familiar to those from the UK. Telly Time comes in a small tuckbox, which contains 59 cards and 35 small plastic chips. Most of the cards are new TV shows. 45 of the cards in Telly Time are brand new Shows. There are three new Genres represented: Chat Shows have a special power: the moment you Develop one, you may rotate all Stars and Ads in one of your timeslots (including the one the Chat Show is going in) to their good sides. Quiz Shows also have a special power: at the end of each Season, you may use any Quiz Shows active in your lineup to convert money into Viewers at a rate of $1M to 1 View..